A ritualist den which is similar to the Soka Ritualist den which was discovered in Ibadan years ago was discovered in Gbongan, Ayedade Local Government area of Osun State. 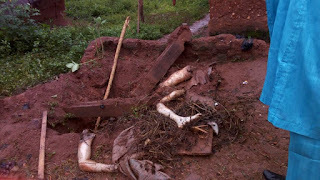 The ritualist den which was speculated to have been in existence for a long while was discovered by suspecting neighbors who were perceiving offensive odor from a building at Idifa, Ile-Eesu compound, Gbongan, Osun State. The suspecting residents however alerted themselves on the odor coming out from the four-room building being occupied by a man whose identity was yet to be known as at the time of filing this report. They however mobilized and busted the building and they discovered three human heads among many other human parts while the occupants of the building were handed over to the Police. When contacted, the Police Public Relations Officer, Mrs Folasade Odoro confirmed the incident, he however stated that investigation was still on to ensure the that the fleed culprits are apprehended and made to face the wrath of law.